I had a very nice outing with my sister yesterday! 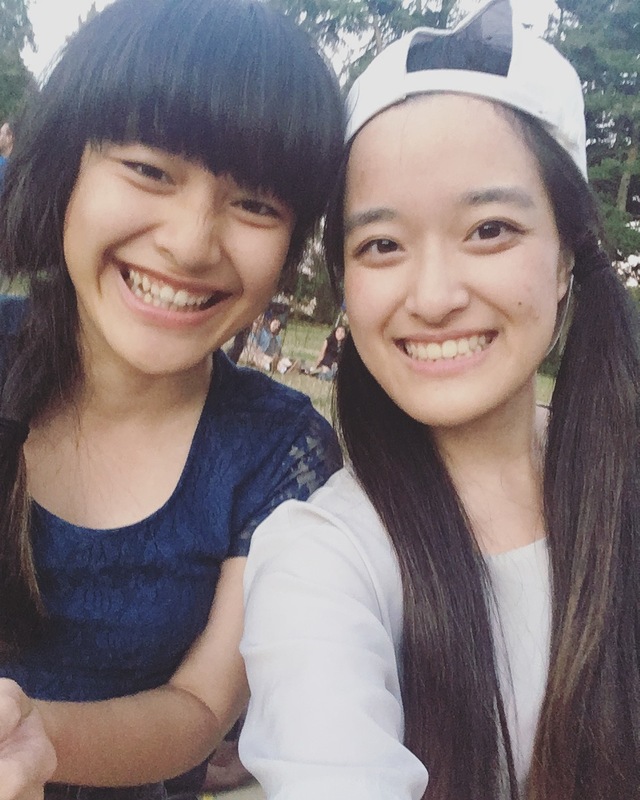 It was apparently the Seattle’s Chamber Music Society’s last day for their Music Under The Stars program which is a program where they play chamber music in the park for free, so my sister and I decided to go. The show starts at 7 but since there was a Seafair parade going on, I wanted to make sure I don’t run into any traffic issue. I mean, I also want to make sure I have a ton of time to spend with my sister because time goes by very very fast when we’re together, so might as well go as early as I can right? So I ended up arriving in downtown Seattle around 3 PM, which was earlier than anticipated, because I didn’t run into any traffic issue (Thank god). Since my sister just got off work, we agreed to meet at sister’s place. At her place, I tried out the cookies she baked, sat, chat, chill for a bit. Then we finally admit that we were both STARVING so my sister suggested we check out Bai Tong up on Capitol Hill since it recently open. We were so lucky we arrived just in time for happy hour. To take advantage of that, we both ordered the Thai Tea Moscow Mule ($6). The Moscow Mule was more on the sour side, in comparison to the other ones I’ve had, but I liked it a lot! It wasn’t too strong and the alcohol wasn’t overwhelming. 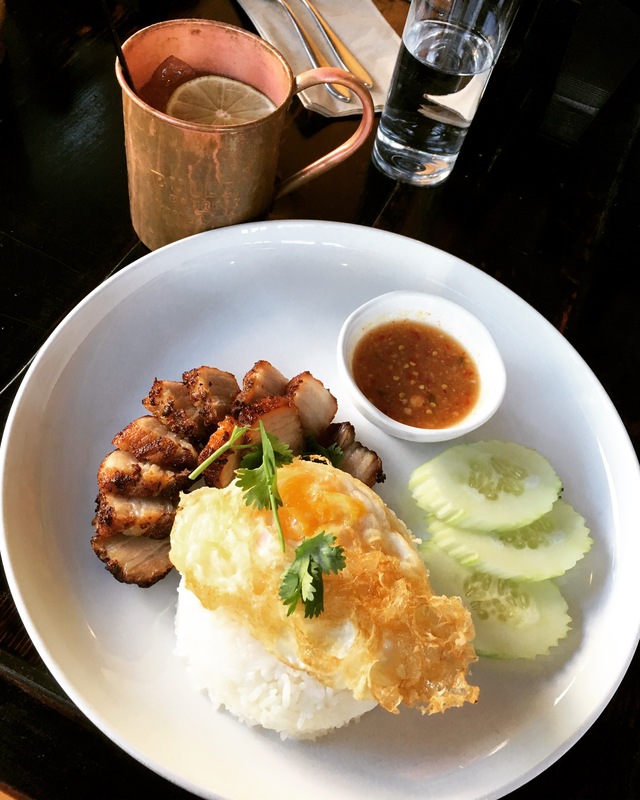 As for the main dish I ordered the Fried Pork & Egg over rice ($11.50) from the Street Food Menu. I honestly don’t know what this is in Thai but it tasted a lot like Grilled Pork Neck. This dish was BOMB. A sour & spicy sauce was served on the side to compliment with the oily pork; this sauce definitely completed the dish. Oh and don’t forget about the Egg. The fried egg was prepared with a runny yolk so that added even more to the yum-factor. Ahh, I’ll definitely go back here again. After the wonderful meal, we had a ton of time left before the show starts so we decided to walk to Volunteer Park instead of taking transit there. It was a pleasant walk as the weather wasn’t too hot. I’ve also never walked around that area before, so it was nice to see the neighborhood as a pedestrian. I wouldn’t mind living in that area, it’s seems pretty peaceful but not too far from the city. Anyways, I’m just rambling off now. I just wanted to write about this before I forget about something nice I did this summer haha. I’m gunna go continue watching Gundam Wing now(things are getting interesting) and also finish designing the office on HHD. I’ll probably fix all my grammatical errors tomorrow at work, or maybe not hahaha.